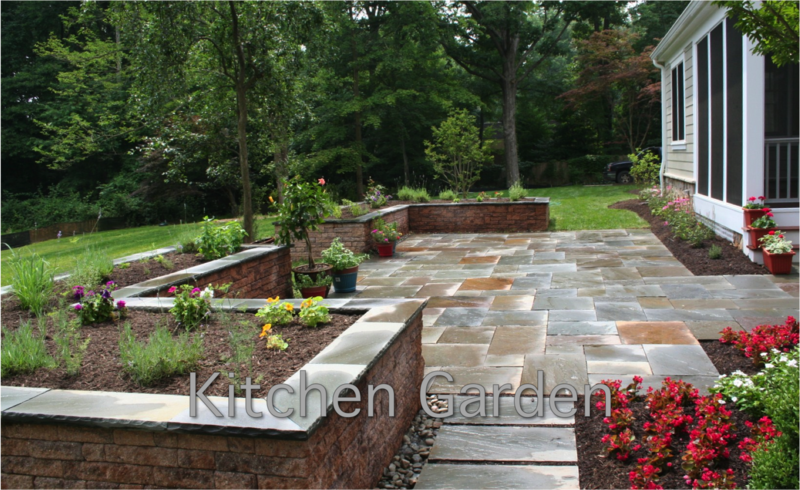 Culinary herbs, vegetables and cut flowers are cultivated in the segmental retaining wall planters surrounding this Bluestone patio. These raised planters make for quick and easy gathering when needed for adding that special ingredient to meals. The planters are constructed with segmental concrete retaining wall units and capped with rock edged Pennsylvania Bluestone. The same Pennsylvania Bluestone in a full range color blend was set in a random rectangular pattern on a stonedust base for long lived natural beauty.